Like Alice Munro and Colm Tóibín, Tessa Hadley possesses the remarkable ability to transform the mundane into the sublime—an eye for the beauty, innocence, and irony of ordinary lives that elevates domestic fiction to literary art. In Clever Girl, she offers the indelible story of one woman’s life, unfolded in a series of beautifully sculpted episodes that illuminate an era, moving from the 1960s to today. 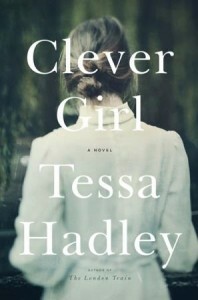 Written with the celebrated precision, intensity, and complexity that have marked her previous works, Clever Girl is a powerful exploration of family relationships and class in modern life, witnessed through the experiences of an Englishwoman named Stella. Unfolding in a series of snapshots, Tessa Hadley’s involving and moving novel follows Stella from childhood, growing up with her single mother in a Bristol bedsit, into the murky waters of middle age. It is a story vivid in its immediacy and rich in drama—violent deaths, failed affairs, broken dreams, missed chances. Yet it is Hadley’s observations of everyday life, her keen skill at capturing the ways men and women think and feel and relate to one another, that dazzles, pressing us to exclaim with each page, Yes, this is how it is.